This Christmas, my second year eating a plant-based diet, I wanted to create something different to replace the meat on the table. 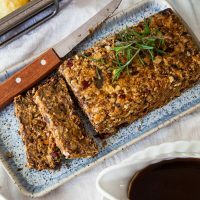 My recipe for this lentil & bean loaf is both gluten-free and nut-free for those who can’t (or don’t like to) eat nut roasts. It took me a few tries to make one I was completely happy with. I wanted that “meaty” texture, without having to use faux meat and I wanted that traditional flavour too. With a combination of beans, lentils, vegetables and oats, you are left with a firm yet tender texture, perfect served with my balsamic onion gravy. 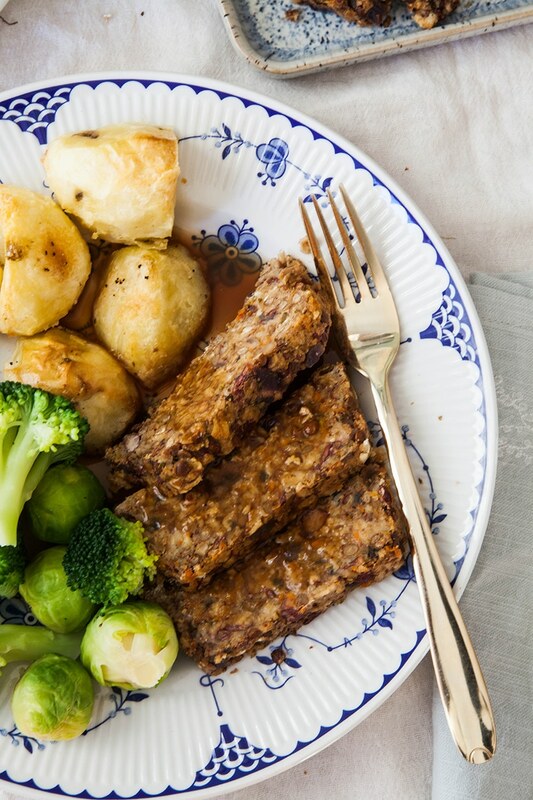 This gravy is not the usual pale and flavourless vegetable gravy, it’s dark, full of flavour and body and pairs beautifully with this lentil loaf! 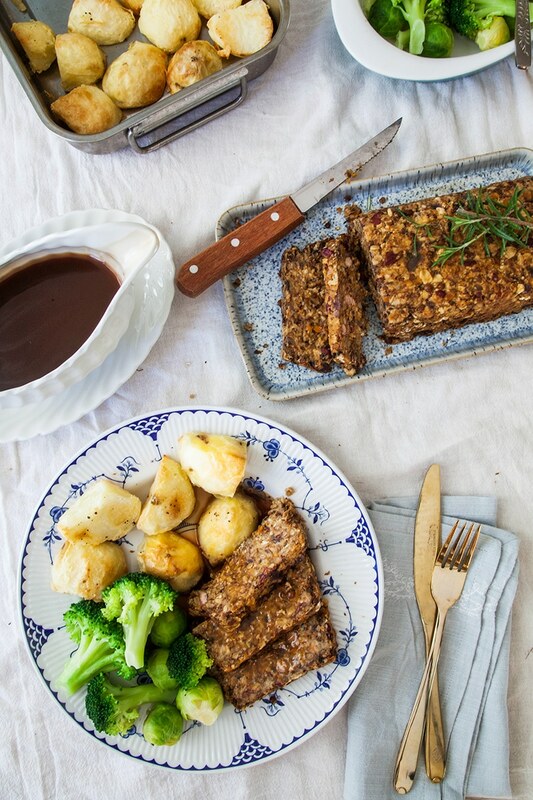 This meat-free, gluten-free and nut-free dish is perfect for roast dinners and Christmas day! Preheat oven to 180c / 350f and line a loaf tin with greaseproof paper. Heat the oil in a frying pan and sauté the onion and garlic until soft. Add the mushroom and carrot and cook for another 5 minutes until softened. Add the rest of the ingredients and use a masher to combine. Don't over-mash, just enough so that the mixture comes together. Add a drop of water if the mixture is too dry, if it's too wet, add more oats. Transfer the mixture into the loaf tin and cook for 40-45 minutes until the outside develops a crust and the inside is firm.. Prepare half a litre of vegetable stock with the stock cube and set aside. Add the oil to a frying pan and sauté the onion with the coconut sugar for 10 minutes. Once it's caramelised, add the arrowroot powder to the pan and stir for a few minutes to combine. Pour in the wine, balsamic vinegar and tamari sauce and simmer until the stock is reduced by half. Add the vegetable stock and simmer again for 10 minutes until you are left with a thick, dark gravy. Optional: for a smooth gravy, blend for a few minutes until no lumps remain. Serve with the lentil loaf and roast vegetables. Previous Post: « Borderfields Rapeseed Oil Infusion Giveaway! I made this for the first time for a dinner party last night and it was a huge hit! Everyone loved it and many asked for the recipe. Thanks so much for sharing! I'll be making another tonight for our own dinner! So pleased to hear that - thanks for the lovely comment, Jacob! Hello i was wondering if i could make it say 6-7 days before christmas and freeze it would that work or should i make it and cook it straight away? I'm not sure how it freezes, to be honest, but you can definitely make it a day or two beforehand and wrap in the fridge. Hi, This looks amazing! I'm making this to take to my family on boxing day. Would you recommend cooking it a couple of days in advance, then reheating it up on the day? Or shall I prepare it beforehand then cook it on the day? Im aware of a busy kitchen and don't wish to get underfoot. You can either make up the mixture in the loaf tin (without cooking) a day or two beforehand and just put in the oven on the day or just cook a couple of days before and re-heat. But if you choose to reheat make sure to cover in foil and maybe add a few drops of water to the tin to prevent it from drying out. Hope you enjoy! thank you so much for this recipe! this is my first Christmas as a vegan, and I have decided to invite close friends over for a thanks giving dinner and will be making this. cannot wait! Hi what is put lentil and also what state do we need to use the lentils soaked and boiled ?? can one use something besides oats? i'm allergic. otherwise, this sounds wonderful! thanks. Hi there! I'm hoping to make this tonight, what herb blend did you use for the 2 tbsp mixed dry herbs? Thanks!! I had some Vegan relatives come for Sunday dinner last weekend and really wanted to create a Sunday roast, In my search came across this recipe. I didn’t have time for a trial run so read all the comments and decided to give it a bash, I didn’t have a back up plan and I was so nervous!! It did not let me down, thank you for a great recipe, that was a hit with vegan and meat eaters. I wanted to make this for Christmas for my in-laws, mother-in-law is vegan and sister-in-law is nut free. I’m so glad I made this in advance to try it because it was not very flavorful and I ended up just making a tofurky for Christmas instead. I followed this recipe very closely but added salt because I suspected it would be pretty bland, given the lack of salt and seasoning. It still tasted flavorless, even with added salt. The gravy was pretty good and added some flavor but this recipe overall was a lot of work for something that tasted very bland. Would love to make this for Christmas. Can I substitute tell nutritional yeast? Hi Sofia, it's OK if you don't want to use it - just leave it out :-) Hope you enjoy! This recipe is amazng, I did't have tinned lentils so cooked Lentilles verdes from scratch. I added some chilli flakes to the mixture, a little bit more tamari and vegetable stock as I thought it was a little dry. The lentil roast was great and tasted delicious especially with the gravy. As I didn't have any red wine so used 200ml vegetable stock and I added a bit of tomato puree. Absolutely fantastic meal had with roast potatoes and steamed vegetables. Great recipe, thank you! We used marmite instead of nutritional yeast and cornflour instead or arrowroot powder and they worked perfectly! Great idea with the marmite - good tip. Glad you enjoyed it! Marmite is not gluten free for those that require that aspect. How much Marmite did you use please? Hi... Can you tell me please, did you use the same amount of Marmite as nutritional yeast, 4 tablespoons?? thanks for sharing this will try this out for sure. cheers! Can I freeze what I don't eat !? I can't seem to find canned lentils anywhere, nor can I find any dried puy. What kind of dried, and how much could I substitute? And can I use cornstarch instead of arrowroot if I can't find that? Unfortunately where I am there is no Sainsburys. I am assuming I would have to order from Amazon? Just cook some dried lentils, love! Hello! I'm actually making this right now, and I have a question. I followed the recipe exactly but when it was time to take the loaf out, it was still gooey all the way through. Can you help me figure out why? What size tin did you use? Mine is a 2lb tin, so it's fairly deep. I would just suggest cooking it for another 10-15 minutes, maybe with a bit of tin foil on top to stop the top browning too much. Let me know how it goes! Hi Maggie, I think it will probably be OK without. It does add a lovely flavour but I think there are lot's of other flavours going on that it shouldn't matter too much :-) Let me know how it goes! I order mine through Amazon and it comes straight to my door! Loved it! Made it twice over the holidays :)))) thank you!! Hi! Can we substitute with steel cut oats? Thanks :) Merry Christmas! I think it should work OK, the texture might be a little different so you may need to use more oats. Hope you enjoy! Thanks! Tried it today, the taste is very good! Although, I suggest splitting the mixture in two (3/4 and 1/4) and not put steel cut oats in the 1/4 top part. It did not cook as well as the one underneath, it was a bit crunchy. Thanks again! I'm making this Christmas tomorrow, I want to prep today should I cook it today or assemble and cook tomorrow? Also I'm using crimini mushrooms, about how much does the 2 portobellos chop up to? Hi Anne, I would prep today and cook tomorrow. I'm not sure, I would use about 6 smaller mushrooms to make up the 2 big ones? Hope that helps! How big is a can of puy lentils? Generally our cans of vegetables/beans etc are 15 ounces here in the United States. Looks amazing....any substitute option for the mushrooms?? Thanks Rachel! Hmm... The mushrooms help with the meaty texture so you could try substituting it with another "meaty" vegetable. Maybe aubergine? Hope that helps! Just making this for my vegetarian sister and me on my first vege Christmas and it smells amazing and the gravy tastes yummy! This is making me look forward to Christmas dinner, I won't be missing turkey! Hi Lorna :-) I haven't personally tried freezing it before but I hear that nut roasts freeze quite well (either uncooked or cooked and cooled first) so I would imagine this would too! Let me know how you get on and hope you have a lovely Christmas. Have you ever frozen this after cooking? Looking for options to make ahead. The gravy was soooo good!! I recently became vegetarian and this is the best gravy I have ever had (meat versions included)! I blended it like you mentioned and that made it the perfect consistency. I think I undercooked the loaf a bit or it could have used a bit more water because it was a tad on the crumbly side but still great. Thanks so much for an awesome recipe! Made this for dinner tonight to check it out pre-Christmas Day. Have to say it was delicious, even the kids enjoyed it. Double bonus! Very straightforward to make and my husband is looking forward to having the leftovers cold in a sandwich with some pickle! Looks delish! What type of wine would you suggest for the gravy recipe? Excited to give this recipe a try this week! Thanks Amber! I cannot get enough of this gravy. For wine, don't use anything expensive - just a good tasting affordable wine. I usually just use a merlot from my local shop but any good-tasting red wine is fine! Mmm that roast looks so good!! Love seeing dinner options that I CAN actually eat and will really give my body all the nutrients it needs! And I'm crazy about that balsamic onion gravy! Sounds awesome and the gravy looks delicious, I love the addition of the wine, it must give it a wonderful depth of flavour! 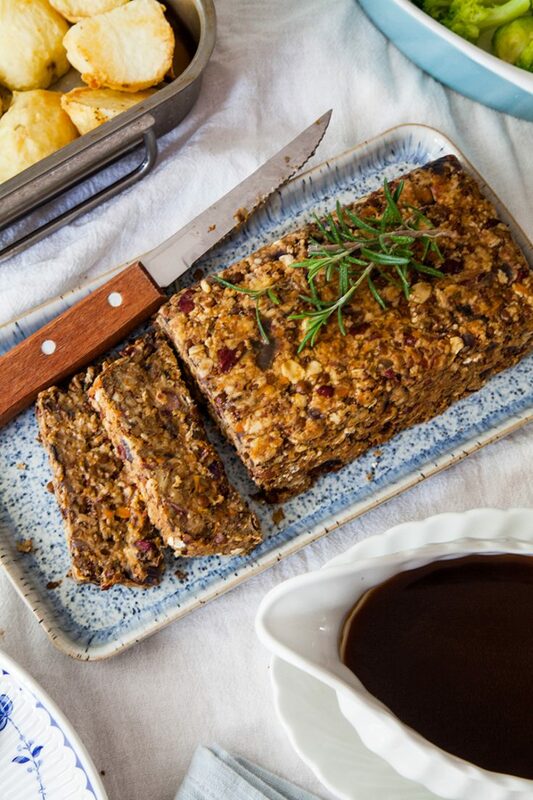 We also love a veggie roast for Christmas Dinner but we have a nut roast for Christmas. We have the same one every year - it has to be vegan & grain free as does the gravy. I'd eat this when I wanted something to make me feel healthy but wanted comfort food at the same time. The best sorts of meals I think!